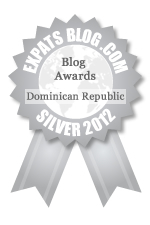 ExpatsBlog.com Expat Blog Awards 2012: Dominican Republic Silver Award! This blog won the Silver Award for best expat blog in Dominican Republic! I love the empathy shown, the quick wit and all around great stories told by The Smuggler. Keep them coming! This blog is absolutely inspiring. I cannot say enough good things about it. Anyone thinking of visiting the DR would be well served by this incredible resource. Can't wait till the next post! There have been so many great stories on this blog! The writing is relatable, touching, and humorous! I love reading this blog! I am constantly checking for new blogs to be posted. I feel like I am living vicariously through the life of The Smuggler. I look forward to reading about the amazing adventures that she will experience next! This blog keeps me on the edge of my chair waiting for the next update! I came across this blog and I LOVE it! The Smuggler shares amazing adventures and priceless insider tips. With out a doubt the best blog about living in the DR. Always something exciting to read about. Amazing blog. I have to space out how often I allow myself to read it because I get so jealous every time! I'm so proud of Esalena!! Amazing blog! I found the legal information so helpful and up to date. I love hearing all her humorous stories of life in the DR. Always encouraging. Well, I don't know what I think about this "hurricane Teresa" business but I'm glad that it can be an interchange of encouragement for both of us. Thank you for expressing many of my feelings in words. I love the story of your feeling of liberation while speaking spanish....I agree no pressure or high expectations less nerves.....good for you, now just enjoy! Also I can't wait to hear about your new adventures with your friend Pocket! I love this blog! Its so entertaining, real laugh out loud moments! Please win, you are amazing! Great blog, always something interesting.